This is so much fun, most kids I know would love this card. It is spooktacular! Thanks for playing along with us this week at Atlantic Hearts Sketch Challenge. Awesome card. It is very spooky !! Thanks for joining us at AHSC !! 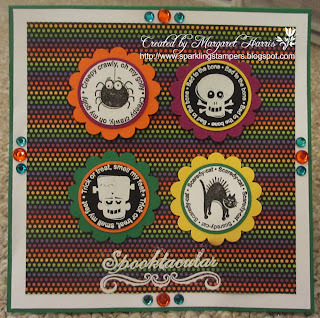 I love how your pulled colors from the background for your punched-out card stock. Really cute card! Oh, the good old days! Love the embossing! Kicking and screaming and you've never looked back! At least this habit isn't fattening!!! So cute. Thanks for playing with us this week. What a fun card! so many great details! A really different one for Hallowe'en with all the colours incorporated into it. Thanks so much for sharing with us at AHSC. I am loving this card! It is a super cheerful for Halloween! Love this card! Thanks for joining us at AHSC! Super adorable! What a fun card! Your card is so cheerful. Thank you for playing along with us at Atlantic Hearts Sketch Challenge. Thank you for joining us this week at Atlantic Hearts Sketch. Your card is beautiful! Congrats on make top three this week at AHSC !! Great job ! !